Disc 1 track 03, 04, 05, 06, 09, 10 - recorded by Jimmy Waldo. Disc 2 track 03, 04, 05, 12, 17; bonus download track 18 - recorded by Jimmy Waldo. A different version of "Thrill Of A Chase" is recorded in 1988 by WARRIOR featuring Vinnie Vincent on vocals and guitar. The song was first roughly demoed by Steven Rosen and Jimmy Waldo. When Vinnie Vincent heard that demo, he loved the song so much that he was keen to do his own version of it. That's why WARRIOR (Vinnie Vincent, Jimmy Waldo, Gary Shea, Hirsch Gardner) went into to studio in 1988 (6 years after the band split up) to record the song. 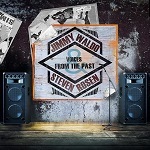 Jimmy Waldo and Steven Rosen were a prolific writing duo at the height of hard rock�s popularity and were two of the go-to-guys for songs. But it didn�t stop there. This writing partnership lasted more than 30 years. And featured on these songs are the cream of the city�s musicians and singers � Jeff Scott Soto, Steve Plunkett, Billy Trudell, Keith Howland, Tim Pierce, Sherwood Ball, Tommy Thayer, Jamie St James, Marc Ferrari, Bob Kulick and more! Steven writes: "This songwriting partnership endured and survived the pummelling and pulverizing hammer of the music business, one that relentlessly and thoughtlessly banged you on the head with rejections and the closing of doors. Reaching out hundreds and hundreds of times to publishers, managers, music supervisors and anyone else who might listen to our music, we were summarily dismissed out of hand. We�d sit for hours writing, recording, bashing our brains out and always coming away with something cool. A handful of the songs here were things I wrote with other people and which Jimmy engineered. Jimmy had by the time we met, already played keyboards in NEW ENGLAND and Alcatrazz and would go on to become a member in BLACKTHORNE, MURDER'S ROW, Quiet Riot and ultimately Graham Bonnet�s band. As time passed, we began writing with more specific artists and projects in mind. 'Naked' was written as a possible song for Heart; 'Ricochet' and 'When A Heart Beats Alone' were written for an L.A. glam rock band Jimmy was producing called Lace; 'City Of Angels' was written for the Japanese NHK network; and 'Outlaws' was written for an indie film of the same name and so on. Because we were writing for certain artists, we both knew we needed to pull in guitar players and singers who could convey a specific vibe. We were able to work with mad gifted players like Keith Howland (Chicago), Harry Cody (Shotgun Messiah), Tony Palacios (Guardian) and Lance Morrison (Don Henley, Rick Springfield). The songs on �Voices From the Past� have remained dormant for years, residing in boxes, hidden in dusty corners. Giles Lavery, Graham Bonnet�s manager and a music historian with an encyclopedic knowledge of all things rock bordering on ultra-nerd, discovered these DATs, ADATs, reel-to-reels, hard drives and even cassettes deep within the bowels of Waldo�s garage. He started listening and was enthralled with what he heard. Giles rescued, resuscitated and resurrected these songs and for that Jimmy and I are eternally grateful."